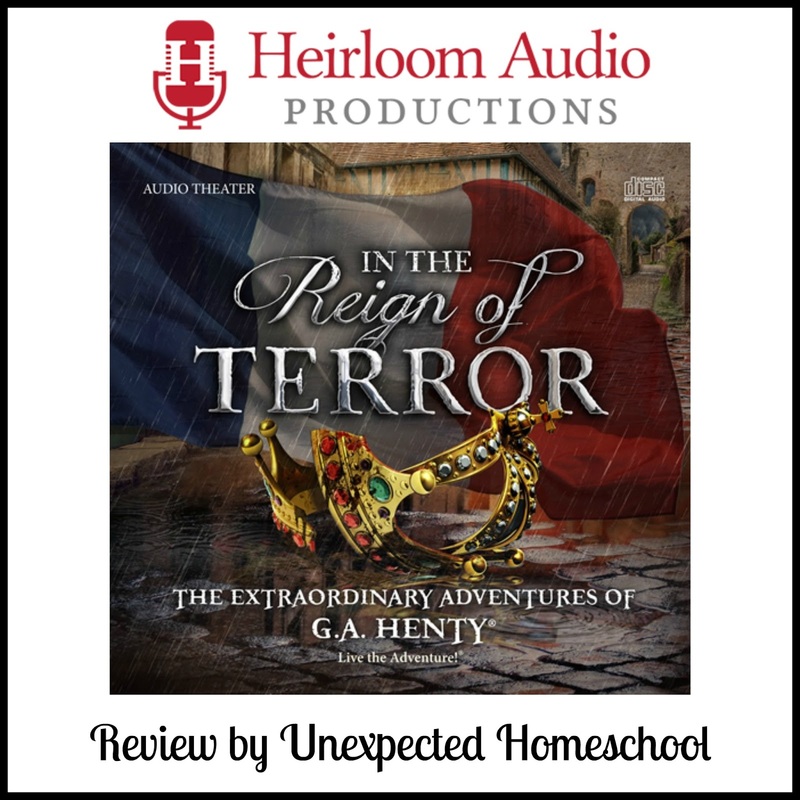 We have reviewed quite a few audio dramas from Heirloom Audio Productions in the past few years through the Homeschool Review Crew. However our current review, In the Reign of Terror, is Amber's absolute favorite! Do you know about Heirloom Audio Productions and their audio dramas? Let me tell you a little bit. Think of the old radio shows where it was a complete immersion experience with voice actors, music, and sound effects. This is not the audio books that we have come to know today. It's like the radio shows of old, where you feel the atmosphere of the story surround you and bring you with the actors. Amber has been listening to the last few of these audio dramas in her room without me, and I almost forgot how wonderful they truly are. This time, with In the Reign of Terror, we chose to listen in the car during a long drive to and from a medical appointment. We received In the Reign of Terror as a two-CD physical set, and for once I actually used my car's CD player. We never do that! Almost everything we use is an MP3 played from my iPhone connected to my car. So, we were very surprised and pleased to find the CD player works (we seriously have used it maybe once or twice, ever), and to find it did fantastic job with creating the surround sound. I knew the Heirloom Audio Productions audio dramas were engaging, but I honestly had forgotten how amazing they are. Halfway through, while driving, I looked at Amber and said "This is so nerve wracking, I need to know what happens. Are they all like this?" She answered with "Did you think they were boring? Of course they are all like this." Well, she put me in my place. This particular audio drama is the dramatization of G.A. Henty's In the Reign of Terror, which takes place during the French Revolution. 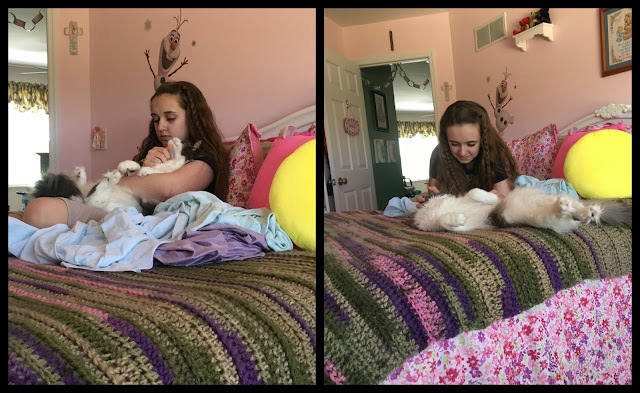 Amber is obsessed with studying the French Revolution, so I knew she would love it, but I personally could not wait to hear more of the story. It was not perhaps the best thing for me to be the driver while listening, but we survived with no mishaps. The story revolves around an young English man, or really a boy approaching manhood, named Harry Sandwith. He goes to live in France with the family of the Marquis de St. Caux. He is to be companion and English instructor to the eldest son of the Marquis. Although the Marquis is kind, it is quickly obvious to Harry that the social divide in France is much greater than in England. The French Revolution had already started when Harry traveled to France, but no one expected it to descend into the reign of terror. Eventually Harry proves to the family through heroic deeds that class does not determine the worth or nobility of a person, but what is in their heart and how they treat others. He is then treated as a cherished member of the family by all of the children - boys and girls, as well as the Marquis. Meanwhile things are deteriorating in Paris, and the Marquis and his mother, the dowager Marquise, travel to Paris in support of the King and Queen. The children, Harry, and a trusted adviser stay at the family home in Burgundy until it becomes too dangerous. They manage to flee with the eldest girl's (Marie) fiancee to Paris. Things settle for a bit in Paris until the royal family is taken away to jail and their deaths. Then the citizens come for the Marquis de St. Caux and his family. The children escape along with Harry and their adviser with plans for the boys to travel to England where Harry's father already is holding a good deal of the de St. Caux wealth. The girls will stay in France for a while disguised as the nieces of their deceased mother's nurse - commoners, and safe. The escape of the children comes at the price of the Marquis and Marquise, who are arrested. Harry sees to the safety of the girls and then plots with Victor, Marie's fiancee, on how to free both Victor's father and the Marquis. Unfortunately, they are not in time. The Marquis and Marquise go through a mock trial and are killed. The same day they receive news that the boys did not make it out of France. Instead the sons of the Marquis were caught attempting to flee and also killed. Marie is devastated and attempts to see Victor, but is captured and imprisoned. Things look hopeless, but Harry is able to free Marie who stays in Paris with Victor, but the other two girls leave France with Harry after a very harrowing time. All through their struggles the de St. Caux family discuss with Harry the American Revolution and what the French citizens are now doing. Harry is of the opinion that the Americans were in the right. They did not want bloodshed, only justice and freedom while the French want vengeance. While the Americans founded their new country on God and his will, the French have turned way from God in favor of human reason using rhetoric to inflame the people instead of truth to inspire. Frequently the story speaks of people seeking God's will and other's turning away. Those who seek God's will may not be spared persecution, but they will always have the peace of knowing God. Along with the physical CD set, we also received a login to LiveTheAdventureClub.com where a whole array of extra features associated with this audio drama are made available. All of the extras are downloadable content to promote learning and encourage enjoyment of the audio drama. An online playlist makes it easy to listen to In the Reign of Terror anywhere, without your CDs. This would have been a fantastic choice for Amber to use with her iPad or iPhone, or laptop. And might have been our first listening choice, had we not had the long car ride come up. The Study Guide & Discussion Starter can be read online or downloaded. In the past we have always downloaded these to Amber's iPad so she could follow along while listening. However, since this was summer break, I let her bypass the study guide all together. Still it is a fantastic way to to turn the audio drama into a complete study of the French Revolution. Listening Well Questions - which basically check to see how closely your student is listening and if they caught all of the pertinent details. Thinking further questions that ask the student to look into details of the story, put themselves in the characters' shoes, or find pertinent places on the map. Defining words - for those vocabulary words presented in the story that may be new. And especially this story, with all of the French words. Interspersed throughout the study guide are Expand Your Learning boxes that give you a little more information about French culture, aristocratic life, and the French Revolution. There are also a couple of Bible studies that relate to the story, along with information on the French Revolution and a direct comparison to the American Revolution. Amber and I both thoroughly enjoyed listening to In the Reign of Terror. Although there was no new historical information for me, I was completely engrossed in the story. Amber said she probably already knew all of the historical information, but it gave her a new understanding of how others saw the actions of the French. The death of the main characters was handled well, but may be upsetting for listeners who have become attached to them. Still, if your listeners are already aware of the French Revolution, these deaths will not be entirely unexpected. We highly recommend this In the Reign of Terror for anyone who wants or needs to study the French Revolution. Other members of the Homeschool Review Crew also reviewed In the Reign of Terror. Please follow the link in the graphic below to read their thoughts.